A blistering start from Latics fired them to the top of the League One table with a 2-0 win at Oldham. Ivan Toney’s first goal for the club followed by Michael Jacobs’ effort put daylight between the two sides within the first 15 minutes, as Wigan made it three wins from three games. As expected, Paul Cook named an unchanged side from the one that saw off Bury with ease a week earlier. And the 1,823 Wiganers in the away end at SportsDirect.com Park would have been forgiven for expecting another goal tally of similar proportions, after what was a blistering opening 20 minutes. With the game not even five minutes old, Lee Evans was already trying to re-create his heroics against Bury with a shot from a distance not too dis-similar to the one that nearly broke the net at the DW Stadium. However, this one was a little tamer and went just wide. It was a warning shot that Oldham didn’t take much notice of though. Just three minutes later, the Welshman was involved in Wigan’s opener with a well taken short corner to Samy Morsy whose dangerous cross found Toney after a couple of deflections. It wasn't the cleanest of strikes, eventually coming off the 21-year-old's backside, but it found its way into the back of the net and Latics had their lead. The hosts continued to invite pressure and Toney almost doubled Wigan’s advantage a few minutes later, but Jacobs’ cross was taken off his foot six yards from goal. It wasn’t long before Wigan’s lead was extended though and it was Jacobs himself who got his second of the campaign. The winger pounced on some really poor defending from the hosts after Nick Powell's through ball caused no end of problems. As Oldham ‘keeper Ben Wilson came out to mop up the spoils, Jacobs’ persistence to chase the ball down paid off as he found it at his feet to to curl an effort into the bottom corner. Wigan kept up the tempo for the next 10 minutes or so with Oldham camped in their own half but a third goal eluded them despite Nick Powell’s speculative half-volley. The ex-United man was in action again not long afterwards, forcing a good save from Wilson after a great lay-off from Jacobs. A shell-shocked Oldham, who had lost both their opening games, finally starting getting themselves into the game but Wigan looked more than comfortable. If there was one negative though, it was joint captains Dan Burn and Morsy both needlessly finding their way into the referee’s book before the break. Burn, angry at a very tame free-kick against him, berated the referee before Morsy gave away two really cheap fouls. The hosts started the second half much better and almost got themselves back into the game within the first minute. Aaron Amadi-Holloway headed down Gyamfi Kyeremah’s cross to Ollie Banks whose crafty flick was well saved by Christian Walton in the Wigan goal. John Sheridan’s men enjoyed some much-needed possession but failed to threaten before Toney fired wide. While they didn’t dominate proceedings quite like they did before the break, Wigan still remained in total control, seeing out the game with the professionalism needed in League One. The difference in class was evident. Credit to Oldham who pecked away but couldn’t find away through. In truth, it was Wigan who looked more likely to make it three and were it not for a last ditch tackle from , Evans would have done just that with an hour gone. Such has been Wigan’s impressive start that Alex Gilbey and Will Grigg can’t find their way into the team following their injury come backs but both made appearances - to rapturous applause from the away end - replacing Powell and Toney. Gilbey had a golden chance to put Wigan out of sight too, when he found himself on the edge of the area with acres of space but his scuffed effort sailed high and wide. 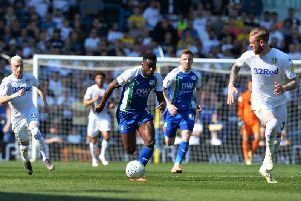 With the game entering stoppage time, Ryan McLaughlin looked to make it a nervy last few minutes but Walton, who had little to do all afternoon, stood strong to ensure Wigan made it three wins from three.